Before we dive into how you can best utilize this equipment, it is best to understand what it is first. A rotary tool is a handheld tool which comes with a bit or disc attachment for different purposes such as sanding, buffing, polishing, sharpening and cutting different surfaces. Unlike tools such as bench grinders, it is versatile, has a compact size and high speeds that make it a better alternative. When used for different purposes, you should attach the different tips or attachments for the job to be done. This article gives you a solution on how best to work on your arts and crafts projects and home repairs, especially when it comes to those tiny spaces that can be a bit of a task to get to. When you understand the basics and put them to the taste, you will be on your way to becoming a professional with the rotary tool. This is a handheld power tool. In that regard, it cannot operate without a power source. You can choose between a corded unit and a cordless unit. With a corded unit, it is less flexible while with a cordless unit, it is mobile and can work as long as the battery has charge. Since you will be moving this tool from one place to another, it is important to choose one that has a great balance of power and weight in order to enhance precision. You have an option of choosing a rotary tool with only two options: high and low. On the other hand, you can choose one that comes with an adjustable speed setting. The latter is more preferable. To hold the bit in place, most rotary tools come with a collet and a nut to secure the bit when it is spinning at high speeds. As mentioned, different bits are used for different purposes. When buying the tool, choose one with an assortment of bits you will need. However, you can always purchase the bit separately. This is for protecting your hands from the excessive friction that would come from the wood or metal being worked on as a result of too much heat. They allow easy visibility when working, as well as protecting your eyes from sparks and dust being blown around. They protect you against fine particles of groundwood debris flying around. This offers protection against excessive noise that comes from the rotary tools when in use. These shoes guide against falling debris that otherwise burns or break your feet and toes. If you may not have this, any shoes closed shoes could work. The first thing to do before you put your rotary tool to task is preparing and assembling it. Assemble the right collet for the bit or attachment you will use. To do this, you should switch the shaft lock button and remove the collet nut using a collet tool. Thereafter, follow up by installing the collet and tighten it. Next, press the shaft lock button and twist it until it is locked. After that, you can now put the bit or attachment fully in the collet. Lastly, fasten the collet nut with the collet tool or by hand until the bit is well secured. You can now plug your tool and begin the task. You can use the rotary tool’s bits or attachments to sharpen chainsaws, lawn mowers, knives, scissors and among others. Before sharpening the equipment or surfaces, you first need to clean them with a cloth to get rid of impurities. Follow this up by grinding the cutting edge until it is sharp enough for use. Once you have your safety gear on and you have set up your tool, begin the process by sharpening at a 12◦-13◦ angle on one side. Repeat the same on the opposite side after you have given the attachment time to cool. Ensure you are sharpening from the base to the tip. Once satisfied, you can switch to the polishing bits and polish your surface or equipment as desired. Many home tools are prone to rust as long as they are made of metal. They include tools such as pliers, hammers, and screwdrivers. Rust on these surfaces is inevitable, but you need not to worry. It is best to do this exercise in a well-ventilated area. For this, you will need a steel brush, abrasive brush, and a vise to hold on to your equipment. The first thing to do is to secure the tools on the vise. This is followed up by attaching the steel brush on the tool and turning it on. Next, work on the tool slowly as you let the steel brush clear the rust away. For larger surfaces, you can use the abrasive brush. Remember to maintain the speeds at a range of 15,000 to 20,000 rpm. Here, you will use the attachments designed specifically for polishing and cleaning jewelry. Whether it is a basic piece of jewelry or an intricate one, a rotary tool is ideal for this. You will need a jewelry buffing compound, cleaning solution, buffing wheels, and a flex-shaft attachment. A point to note is that a black polishing wheel is more aggressive while a pink/red polishing wheel is finer. Begin by attaching the buffing attachment on your tool. Thereafter, turn on the tool and set it at the lowest speed. Next, remove the buffing compound. Remember not to use too much pressure to avoid softening and splattering. 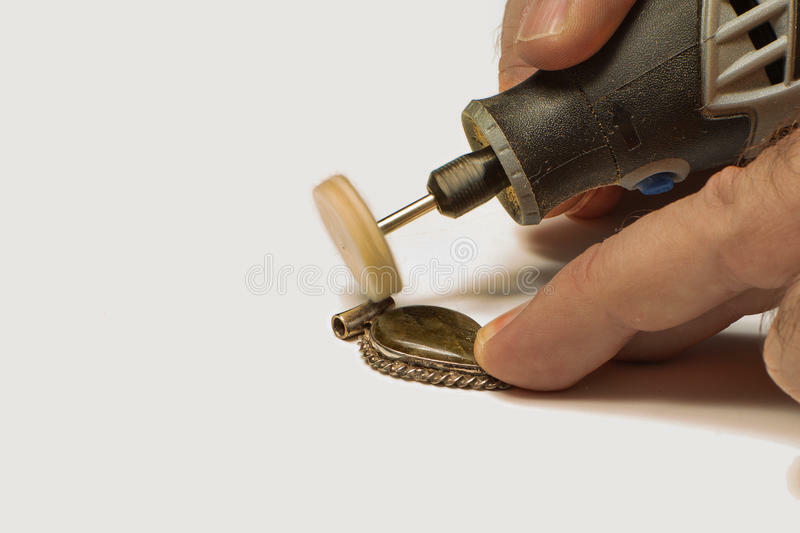 Hold the jewelry securely and polish it on the tool while applying moderate pressure. Keep pausing while you rest and let the rotary cool down. Repeat this until you are satisfied with the result. After you are done, dip the jewelry in the cleaning solution and let it soak for some time. After that, remove it and wipe it with a cloth to dry. There you have it! A shiny piece of jewelry. So as you have seen, it is not that complicated to use a rotary tool as it has been made to believe. Remember to attach the bit or attachment that is intended for the job. Also, the abrasiveness of the attachment is dependent on what you are working on. Once you master the technique, you are good to go.